The Korea Herald is publishing a series of interviews on promising startups in the financial technology industry. This is the 10th installment. - Ed. Despite living in the era of information technology, financial consumers in South Korea have found it hard to gain access to trustworthy information online about financial products to compare and choose what suits the best. 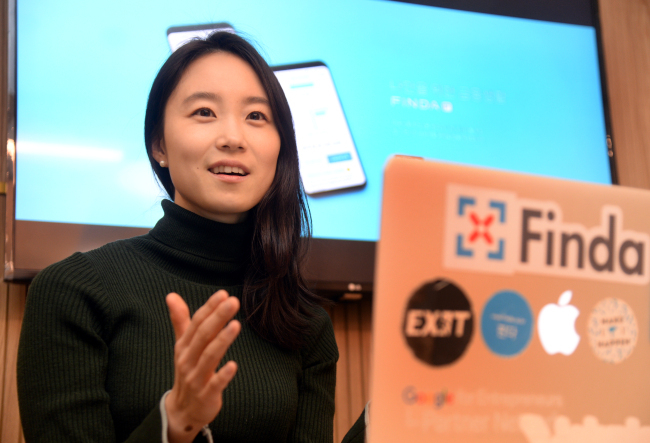 Lee Hye-min, co-chief executive officer of financial technology startup Finda, said financial consumers’ basic necessities had been left unfulfilled in Korea for decades, as none of the key players, including local financial firms’ online platforms, giant web portals like Naver and individual brokers linked to certain firms, played an adequate role. Finda operates an eponymous web portal that provides information about over 7,000 financial products -- ranging from personal and mortgage loans, investment instruments, credit cards to insurance products -- standardized in Finda‘s own format. Users can be offered easy-to-understand and up-to-date information about products online, she said. Finda gathers information primarily from an open API by the Financial Supervisory Service, but since the FSS’ database provides data, including interest rates, of the previous months, Finda reflects updates directly from sellers -- banks, insurers, credit card firms and peer-to-peer lending platforms. The platform service -- primarily targeting consumers in their 20s and 30s who earn an income but hold poor credit scores -- is designed to boost convenience and minimize a process that they might find cumbersome, Lee said. 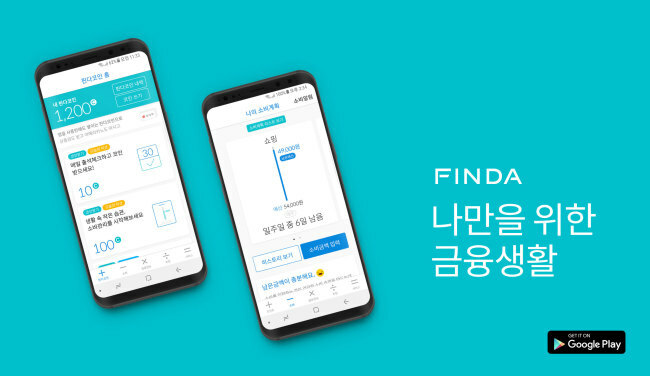 Lee envisioned that Finda, down the road, would become an online financial marketplace, where users could directly purchase a product listed on the Finda platform. Such a process is currently met with regulatory barriers in South Korea, as a banking product can only be sold by a developer bank. Lee said the sellers of financial products are not to blame for the consumer inconvenience. Rather, Finda‘s platform can relieve extra burdens of the firms that they should reach out to online outlets not to be left behind. She stressed their core responsibility is to develop quality financial products. Lee also wanted to tackle some online-only products’ “low level of exposure due to lack of online channels” through the Finda platform. To fulfill such needs on the seller side, Finda created a separate channel on its website financial firms can use like a blog to promote selected products online. At most 10 financial firms can use the service, while its constituents are subject to change on a monthly basis. The service, launched in April 2016, has been available only on the site’s desktop version, while over 90 percent of users visit the Finda website using mobile devices. Now Finda eyes mobile adaption, which will add a reward system, user activity tracking and push alert function to the desktop version. Its open beta came out in January this year. During the interview Lee pinned high hopes on its algorithm-based product recommendation services, in part realized through a chatbot. The algorithm, mainly built on behavioral data, has further room for development after Finda manages to compile users’ financial data, Lee said. The algorithm was born after six months of development. At Finda‘s nascent stage, co-CEOs -- Lee and Park Hong-min -- worked together to develop a prototype database. Lee analyzed keywords and queries, while Park Hong-min, based on his work experience in Mirae Asset Global Investments, approached the process with a deeper understanding of a financial product, she said. Such database became increasingly delicate, to the point where, for example, a personal loan product can be parsed into over 130 factors and a deposit product can be disassembled into over 200 factors. Finda, founded in October 2015, is Lee’s fourth startup. Prior to Finda, Lee led curation service provider Glossybox, e-commerce startup People & Co. and artificial intelligence-powered health care app operator NoomKorea.